Learn how to write songs every day! Learn how to write epic songs! If you are thinking of going all in on a professionally recorded CD or EP, or trying to get the best results from your home studio, you can learn from Ian Sherwood’s experience with his 5th studio album Bring the Light. Ian told me the step by step, behind the scene, story of recording his album: from choosing the songs, to recording, post production, to receiving his CDs from the manufacturer. 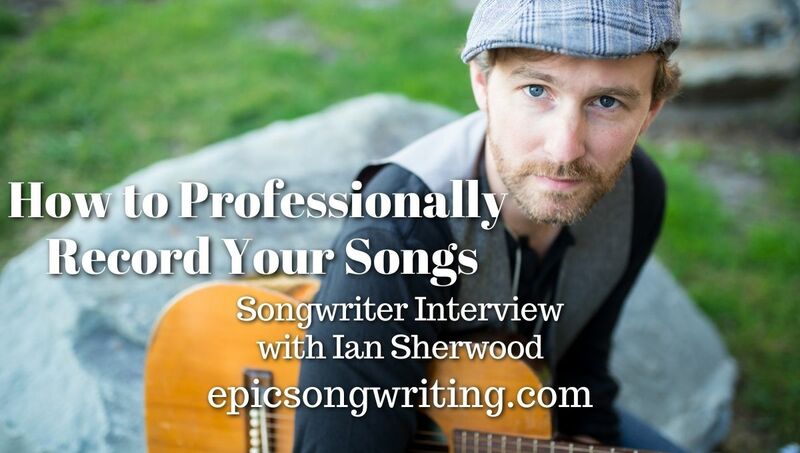 This article summarizes an interview with songwriter Ian Sherwood. He described the process of planning and recording his latest album, Bring the Light. To improve readability I changed a few words of his words and slightly adjusted the order of the conversation. My Take: my after-the-interview personal commentary and clarifying comments. Are you really ready to record? You need to know what you want to accomplish with a CD. Have a plan for the finished CD and what you want to do with it. If you want to be a touring musician then tour first. I recorded my first CD in Toronto, then moved back to Nova Scotia. I should have toured first, then cut a CD. Start building an audience and find out what songs and themes resonate with them. If you plan is to go pro, play your music to live audiences before you record it. My Take: Figure out what you want to achieve. Then figure out how you will do it. Don’t end up with a thousand CDs in your basement because you don’t have an audience to buy them. Your songs need to be great! Get trusted opinions on your songs to help you improve them and to be sure they are ready to record. My Take: Test your songs and get constructive feedback on them. It is easy to fall in love with your own songs after being immersed in them. It’s more important that other people can live/love/understand them after a listen or two. Share your songs (live and rough demos) with people, not FaceBook groups, that can provide useful feedback, and follow it. Learn from people’s reactions to your music before investing in a recording session. A producer helps you through the recording process, providing guidance, experience, contacts and a second opinion. Choose someone who understands your artistic vision, helps you achieve it, and believes in you and your music. A producer’s job is to make sure to keep the talent (you) from feeling pressure, performing at their best and keeping the project within budget. I chose Dan Ledwell to produce Bright the Light. He knows my music and we had worked together before. Find records form acts, especially local acts, that you like the sound of and are a level or two above you. Check who produced it and contact them. It won’t hurt your career asking them to produce you. Ask them for referrals if they can’t fit you in. Good producers are busy people. Most producers have either their own studio or have relationships with people at their favourite studios. They will help you choose one that matches your style. If you don’t have a producer, look for a studio the same way you would for a producer (above). We used Dan’s studio for Bright the Light. There are many things to do and plan before you get to the studio. Dan and I spent a week choosing songs and on pre-production. We started with about 50 of my songs. We each made a list of the best songs. If a song was on both of our lists, we moved it up the master list. We reviewed the master list again and finalized the songs for the CD. Once the song list was completed, I reviewed and experimented with different ways to play the songs. I also experimented with the tempo and key to find the best for my voice and the song. I recorded a rough demo for each song on my phone. I played guitar and sang through the entire song, with a click track in my headphones. This demo became the guide track in the studio during the recording phase. It doesn’t need perfect sound quality because it guides your musicians through the song but won’t be used in the final recording. If the arrangement has an important horn section, I added the lead horn. This is great practice… if you can’t play the song through perfectly, you’re not ready to record it. A reference track has the the sound or groove you are looking for in your own song. Use it to communicate your idea for the instrumentalist on your recording. In my case, I usually have my producer suggest reference tracks after talking through a song with me. My Take: Using reference tracks are an old mixing hack to compare sound levels and instrument sounds in a mix with a polished song. With a sonic goal to aim for you can get a great mix faster and with less frustration. A producer can help you plan how much studio time you need to book and keep you on budget. My Take: If you don’t have a producer, discuss your needs and experience with the studio techs. Recording will take longer than you expect. Book as far in advance as possible, excellent studios are busy places, you might have to work around their schedule. My Take: Once you know when the studio is available, start booking musicians to record their parts. Side musicians (not regular band members) have other commitments, so plan in advance. Figure out who you will be hiring to cover other services you need, such as photography, cover art graphic design, CD layout, manufacturing. There are other steps (below) in the production and post production phases that you will have to plan and organize in advance. My Take: Know what else you need to take care of and start checking on other people’s availability (and price) so you know what to expect and when to expect it. Session musicians are all different. Some like to rehearse in advance, others thrive on surprise and prefer to figure it out as they go. Have a conversation with each musician and do what works best for them. They want direction, so communicate clearly. They want to please you… they are happy when you are happy. Trust them to bring their best to your songs. For the drum tracks, I didn’t send the tracks ahead to Michael Belyea. He sat down without knowing the songs. After 10-20 minutes trying ideas and with feedback from Dan and I, he figured out his parts and we recorded it. My Take: Track (noun) one instrumental part in a mix. Track (verb) record a vocal or instrument in the studio. To add to the potential confusion, Track (noun) also means one song on an album or CD. It is common to record a musician’s part on every song in one session. For Bring the Light, the drum parts for all the songs were recorded in one day, from noon to midnight. It’s easier to set up and sound check an instrument once and also get a consistent sound through the entire album. It’s also easier to fit other people’s schedules. Recording parts in the studio usually starts with the drums. The drummer plays along with the guide track to create the rhythmic foundation for the song. The bass part adds the the harmonic foundation. Collectively the drum and bass parts of the rhythm section are called the bed tracks. My Take: Professionally recording a drum kit is one of the most important reasons to book studio time… it’s one of the most difficult instruments to record properly. Poor sounding drums scream “amateur” and will bring down the quality of everything else in your song. Usually instruments are recorded in the following order. Drums, bass, rhythm guitar/piano, lead guitar, other instruments, lead vocal, then backing vocals. My Take: The rhythm section, drums and bass, create the foundation of the song. Chords are added to the groove with rhythm guitar or piano. Lead melodies are easier to play within a chord context, so lead guitar, then other melody instruments are recorded next. Vocals are easier to sing and pitch with a full band sound. Lead vocals are tracked first and backing vocals afterwards so singers can blend and harmonize with the lead vocal. I recorded the rhythm guitar parts next. Practice your part with a metronome so you are used to playing with steady time. In the studio, you will be playing with the bed tracks that are already recorded. It can be hard to play in time while you’re watching the clock, worrying about money. It can also be disorienting to play without singing, so practice that too. For my first three albums, we tracked my singing and guitar separately. For the next two, I worked with a producer and we tracked my singing and guitar at the same time. Recording vocals and guitar off the floor can be harder on the performer. Although you might be used to doing it, when you have a weak vocal take, it’s harder to comp the vocals (combine parts of several takes into one final version) with the guitar in the same track. So you have to get the whole thing right. You also need experienced engineer who knows how to record it properly. It’s standard practice to record each instrument separately because it’s easier to manipulate the tracks and get a clean, full sounding mix. Once all of the instruments were recorded, we tracked my lead vocals. We would take three passes through the whole song, have a listen and slice the best parts of each take into a final track. The backing vocals were recorded last so the singers could blend with my vocals. Do you really want to know you missed out on this? I want to write songs! Do you want to know you missed out on this? Once the Tracking is completed in the production phase, post production begins. Traditionally there were three different people performing three separate steps: recording, mixing and mastering. Now these steps are blurred. Dan was the producer, recording engineer and mixer for Bring the Light. As You Track, especially common in a home studio, each track is gradually mixed in as it is recorded. This “rough mix” as you go, makes it a little easier to add each new track because it already sounds closer to a final mix. In House Mix, mixing is left until all parts are tracked, but done by the recording engineer or by someone else in the same studio where the recording was done. Traditionally the mix was sent out to another studio, where a mixing engineer created the final mix. The mixing process depends on the engineer. There is no industry standard. One common scenario is the mixer creates a mix of one song, gets feedback and then the mixes the entire album in a similar style. For mix feedback on Bring the Light, I put on headphones and listened straight through, making notes on anything that I noticed that stuck out or needed attention. Dan did the same, we compared notes and he went back to adjust the mix. We had 3-6 sets of mix notes and remixes for each song. Dan’s prefers to “Mix As You Track” where a rough mix is created as each instrument is added. So the drums and bass are “mixed” before adding guitars. This tends to be faster to finish as it’s done as you go. It’s also easier to track new parts when it sounds closer to the final mix. Once a mix is finalized and approved it goes to Mastering, a mystical and often misunderstood, but vital process. Mastering is taking a cake and icing it. This is a required step, your music isn’t radio ready without it. There are several steps including: equalization (EQ), multiband compression, level matching between songs, overall sound levels on each song, balance between left and right channels, and compression to make your song sound better in every format from earbuds to studio speakers to radio. It also includes lining up the track, adding 2 seconds of silence between each track and encoding the metadata for each song. My Take: Metadata is information hidden in the track that tells computers the title, performer and songwriter(s). It’s used to track spins so your music can generate royalties when it is played, for example, on the radio. Sometimes the artwork, photography, CD packaging layout and manufacturing can be found in a one stop shop, other times you will need to use several different services. Plan and schedule ahead so the album artwork is ready when the music is mastered and ready to send to the manufacturer. Take time to fit a photo shoot into your schedule. Plan for delays in turn around time between the shoot and receiving the photos. It takes time to edit and touch up photos. A reshoot can be necessary if the shoot doesn’t get you the result you want. Either a painter or photographer creates the art for the CD cover. Be clear with your conversations about your vision, this will be the visual hook for your music. Like mixing, expect some feedback back and forth. Artwork can take longer than you expect, especially if you need revisions. Usually a graphic designer creates the final CD layout, combining the cover art and fits it into the template required by your manufacturer. All of the songwriting credits, if the songs weren’t all written by you (including co-writers and songs written by others). and thank everyone who helped you get this far! There are many companies that manufacture CDs. Practice due diligence when you choose one. Get recommendations and read third party reviews. Price is only one factor, also consider customer service, turnaround time and my best tip… get your CDs pressed in your own country so you don’t have to deal with import duty or extra paperwork. My Take: an important distinction is “replication” where CDs are pressed, which is higher quality, than “duplication” where information is burned onto a CD in the same way you would burn a CDR. Act like a professional and pay for better quality! When you’re sure everything looks how you want it to, sign off on it. Once it’s manufactured, they will mail your CDs to you! Bring the Light took 7 months from pre-production to the manufactured CDs arriving. It can take less time but you have to allow for revisions, unforeseen delays and fitting into other people’s schedules. I also did some touring and worked on other projects during this time. When you’re preparing for an album, songwriting can take as long as you want it to. Touring can take as long as you need to get your music together and build an audience. I took one week for pre-production. Recording was a month of days, in January and part of February. It’s not ideal but you could get an album recorded in 14 days… part-time it could be done in 6 weeks. Mixing can be a complicated process, the turnaround time depends on the number of revisions you need and how many other projects your mixer has on the go. Mastering is similar. Artwork and photography also take more time to turn around if you have revision requests. It’s reasonable to give yourself 6 months from pre-production to having your professionally recorded CDs in hand. What else do you need to know to professionally record your music? 0 responses on "Professionally Recording Your Songs"